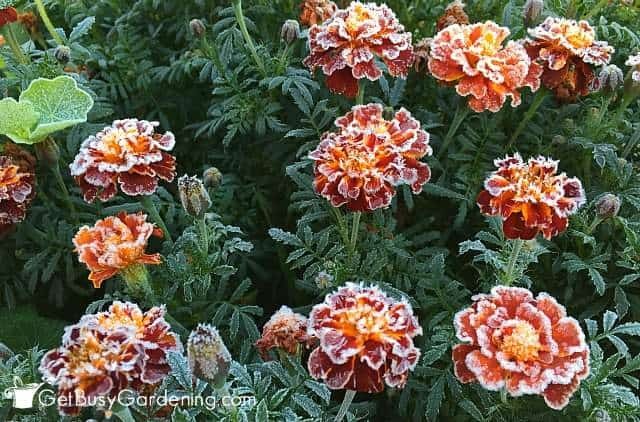 talk about which plants need to be protected from frost, different ways to protect plants from frost, and what to use to protect them. Then I will show you exactly how to protect your plants from frost, step-by-step. For gardeners that are used to growing in cold climates, frost is just something we know we have to deal with every year. 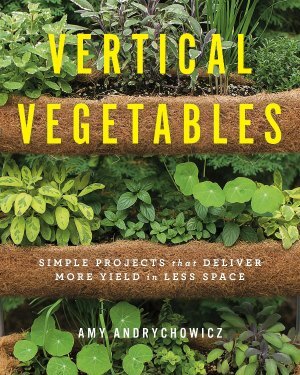 But for new gardeners, it can be a very confusing topic. Why do you need to worry about frost proofing plants? What does frost do to plants? How cold does it have to be for frost? How do you cover plants to protect from frost? And how the heck do you know what plants should be covered for frost anyway? Don’t worry, I’ve got you covered! I will answer all of these questions, and give you many more details about protecting plants from frost below. So let’s get started. We’ll begin by talking about what frost does to plants first. How Does Frost Affect Plants? What does frost do to plants anyway? Though frost won’t usually kill them, plants affected by frost can have minor to severe damage, depending on the plant and how hard the frost was. Damage to plants can be as minor as brown leaf edges and wilted flowers which just makes plants look ugly. But frost damage can be much more severe than that. Severe damage can ruin your crops, turning them to mush and rendering them inedible. It can also stunt sensitive vegetables and flowers, meaning the plants will stop growing for the season. The first few frosts aren’t usually killing frosts, but even a light frost is enough to ruin sensitive flowers and vegetable crops. Taking the time to protect plants from frost damage will extend your growing season, sometimes by several weeks. How Cold Does It Have To Be To Frost? Many people wonder at what temperature to cover plants. Frost can occur any time the temperature drops below 40F degrees on a clear, windless night. However, there’s not really a specific frost temperature, it depends on the conditions. Just because it gets below 40F doesn’t mean frost is inevitable. It won’t frost if it’s windy or cloudy, or when it’s raining outside. If the forecast is predicting overnight temperatures below 45F, that’s when I start to get nervous, and pay closer attention to the weather conditions. If it seems the conditions are just right for frost, and it may dip below 40F, then protecting plants from frost is a good idea – it’s better to be safe than sorry. Which Plants Need Protection From Frost? Not all plants need protection from frost. Cold weather garden plants, like perennials, trees and shrubs that are hardy in your growing zone are all plants that withstand frost. Many types of annual flowers, herbs and vegetables are also cold weather plants that survive frost without any damage. The most important plants to protect are frost sensitive plants like tropicals, tender potted plants, houseplants, some types of annual flowers, and frost sensitive vegetables. Frost sensitive vegetables (aka warm weather vegetables) that will need to be protected from frost include plants like tomatoes, beans, peppers, eggplant, melons, squash, tomatillos, okra and cucumbers. 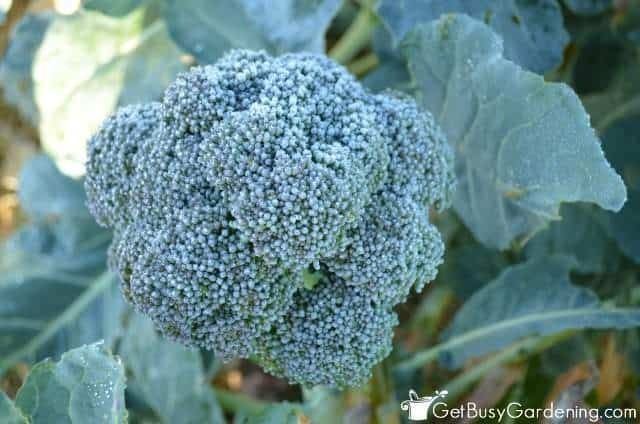 Cold hardy vegetables like peas, lettuce, spinach and other salad greens, carrots, broccoli, cauliflower, cabbage, kale and Brussels sprouts, are frost resistant plants and won’t be harmed by a light frost (in fact, many of these vegetables taste better after being touched by frost). There are a few things you can do to prevent frost damage on plants. First, if it looks like the overnight conditions will be favorable for frost, water your plants well that morning. 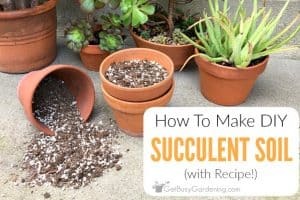 The water in the soil will heat up in the sun during the day, which helps with keeping plants warm overnight, and further protecting plants from frost. The best way to protect plants from frost in your garden is to cover them with some kind of plant covering material. Plant covers for frost protection include things like commercial frost protection fabric, frost bags for plants, cloches, row covers, or other types of specially designed frost covers for plants. You can use the same types of outdoor plant covers you use in your garden for protecting potted plants from frost. However, you may find that covering your potted plants is more work than just moving the plants inside. If they’re light enough, you can simply move potted plants into a porch, shed or garage overnight. On the other hand, if you have a lot of containers like I do, then lugging them all inside at night and then back outside in the morning is a huge chore. So, using garden plant covers for frost protection may end up being the best option. To make it easier, you can group the pots together to cover them all at once. Sensitive plants can be protected from frost by covering them with some type of frost cloth for plants. It’s best to use a lightweight garden cover cloth so it doesn’t weigh down the plants. I prefer covering plants with sheets or lightweight cloth blankets. However, bed sheets can be expensive to buy, and you risk staining or ripping them when you use them as garden blankets for plants. Commercial frost cloth is very inexpensive to buy, and made specifically for protecting plants from frost. So you don’t have to worry about ruining your spare bed sheets. When it comes to plant frost protection fabric, you have lots of options! Burlap plant covers, a commercial plant tarp, a garden frost cloth roll, a tent style garden frost cover, a frost blanket for plants and floating row covers all offer wonderful protection against frost damage. 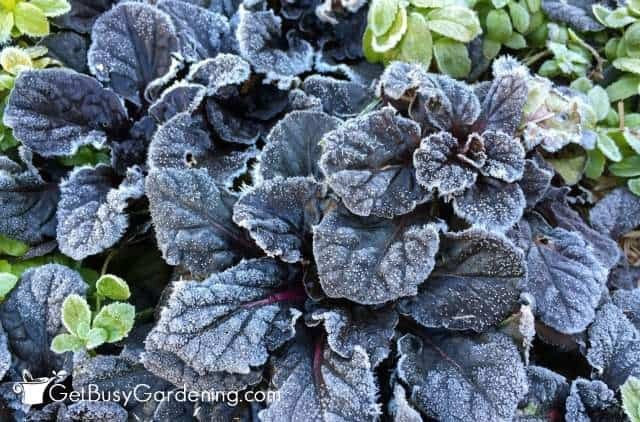 Can You Cover Plants With Plastic To Protect From Frost? Do not use plastic for covering plants to protect from frost unless you’re using a specially designed plant protection cover or support. If done incorrectly, covering plants with plastic can cause more harm than good. Plastic traps moisture under the cover, which can freeze and cause severe damage to the plant. If you must use plastic rather than cloth to cover plants, use stakes or some other kind of support to make frost tents for plants. 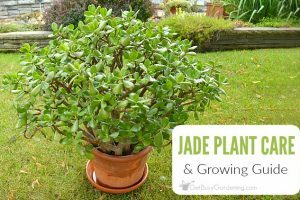 Take care to ensure the plastic isn’t touching any part of the plant or leaves. 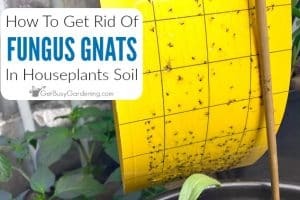 When Should I Cover My Plants? The timing for when to cover plants for frost can make things a little complicated. You don’t want to cover the plants too early in the day, or they could get overheated in the sun. On the other hand, if you wait too long after dark, not only is it harder to see what you’re doing, but the soil will start to cool down quickly. The best time of the day to start covering plants for frost is after the sun is off the garden, or right before sunset. It’s easiest to cover your plants before it gets dark in the evening, but don’t worry if you don’t get it done until after dark. The chance of frost is highest in the early morning, so you have a few hours after dark to get everything covered. Plant cover fabric works for protecting plants from frost by holding in the heat that rises from the soil, keeping plants warm. 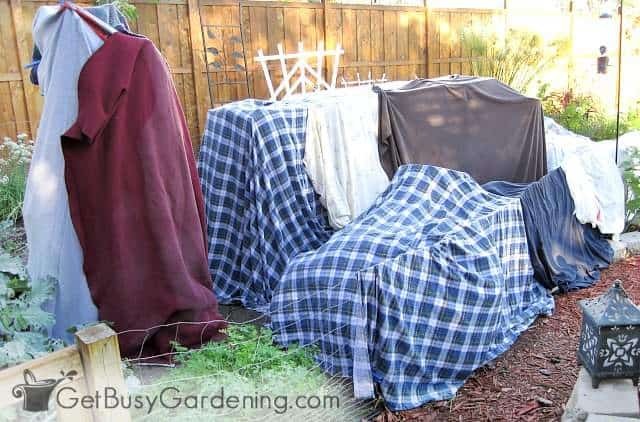 So, the best way to cover plants from frost is to drape the fabric over them, and allow it to pool loosely on the ground. Do not wrap the plant like a Tootsie Pop Sucker; where the fabric only goes over the foliage, and then you seal it around the stem or base of the plant. This won’t protect the plant very well, and may not prevent frost damage on plants. It’s also a good idea to secure the frost fabric so that it won’t be blown off if there’s any wind. I use clothes pins to hold the plant blankets closed, and connect them to each other to keep them secure. You could also secure the bottoms of your frost cloth with plant cloth pins, rocks or bricks to hold them down if that’s easier for you. 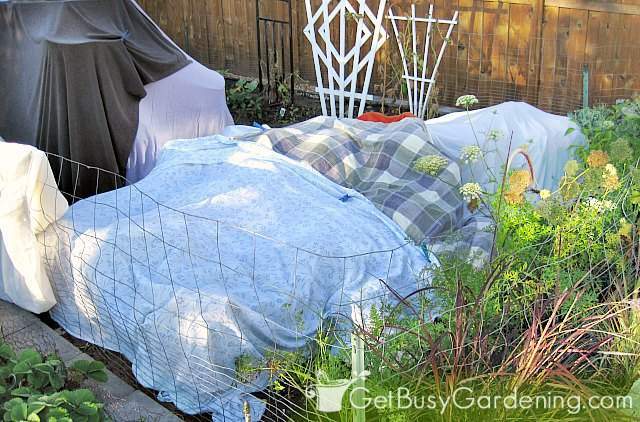 It’s also important to remove heavy garden frost protection covers in the morning before the plants get too warm. So be sure to uncover your plants immediately after the threat of frost has passed. This is usually soon after the sun has hit the area in the morning. 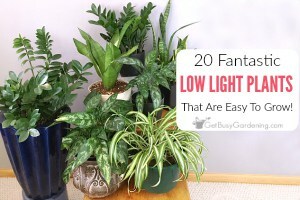 Leaving the plants covered too long in the sun can overheat the plants, which can be just as damaging as frost on plants. If you wake up to a frosty morning and forgot to cover your plants, that doesn’t mean everything will die. Many plants will survive a light frost with only minor damage, and there are steps you can take to try saving plants from frost. If the frost was severe, then the damage will probably be noticeable right away. 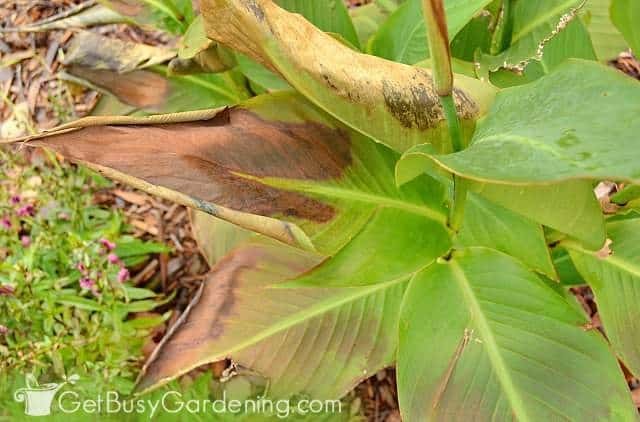 But sometimes you won’t see damage to frostbitten plants until after they start to warm up. In that case, time will tell how severe the damage is. Here’s what to do if plants get frost. First, leave them be and wait for a few hours to assess the damage. Many times you won’t know how severe the frost damage is until the plant thaws. Then, if the damage is minor, you can prune off the frost damaged leaves, flowers and fruit and give the plant time to recover. Unfortunately, you may not be able to save severely frost damaged plants. Covering plants from frost can be a lot of work, I totally get it! But protecting plants from frost is worth the effort to extend the growing season. Remember, you only need to worry about protecting frost tender plants. Cold hardy garden plants will not be damaged by frost. 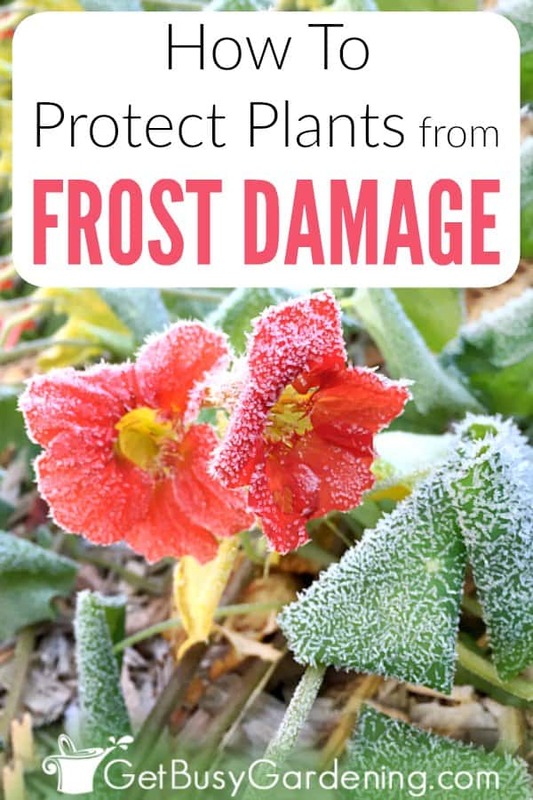 Share your tips for protecting plants from frost in the comments section below. I often lay a string of Christmas lights around the plants in the planting beds. Then when I tent them with sheets, it adds just a couple of degrees more warmth. That’s a great idea Grace! Thanks for sharing your extra frost protection tip! 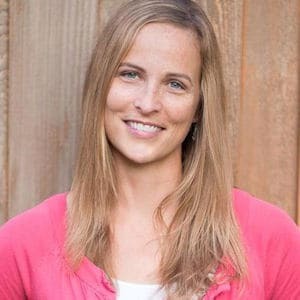 Great tips – so glad we don’t have worries of frost down south until about mid November. I normally use tarps, looks like you may have used sheets? Fall planting is in covered raised beds so slipping a tarp over the cage is a breeze and keeps those veggies growing through winter. So great to serve broccoli from the garden in December and January. Enjoyed!! Honestly as you say covering plants with fabrics can be a pain, short of row hoops i’ve never really wrapped plants (with burlap for example). One thing I think for the lazy gardener which is useful is there are all sorts of companies making small greenhouse and hotboxes. They also make fairly useful covers for raised beds if you are leveraging them. 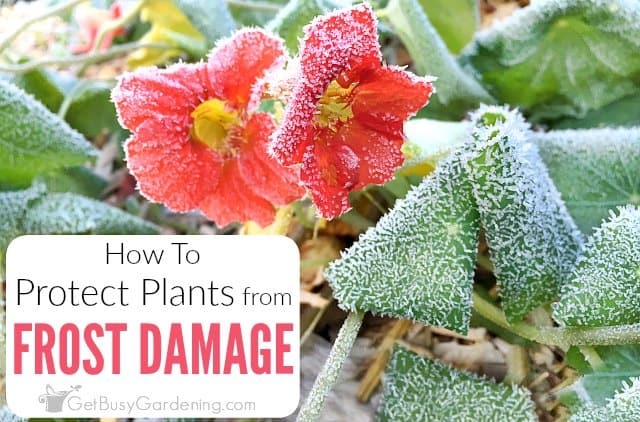 Great suggestion for more ways to protect plants from frost! Thanks for sharing your tips.